An average dog sleeps between 12hrs to 18hrs a day. Unlike humans, their sleeping patterns are spread out over the day. Interestingly dogs have similar sleeping stages to humans from barely sleeping to deep and REM sleep. A dog’s sleeping position also contributes to how much sleep the dog gets. Scientifically sleeping positions have been said to reveal a lot about your dog’s temperament. The sleeping position adopted by a dog is determined by many factors some of the significant factors that determine a sleeping position adopted by a dog are his personality, alertness level, temperatures, vulnerability, and comfortability. 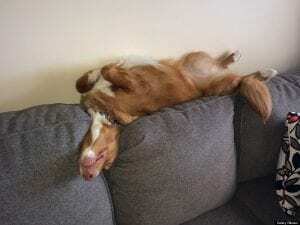 An examination of a dog’s sleeping positions and the reasons that prompted d the dog to adopt it is in order. The following are the main dog sleeping positions. This is a restful, comfortable position especially when the dog is napping. It is a common sleeping position where the dog sleeps one side of his belly while his four paws are spread out. The dog angles his legs in such a way to allow him to cool and air out his core organs. 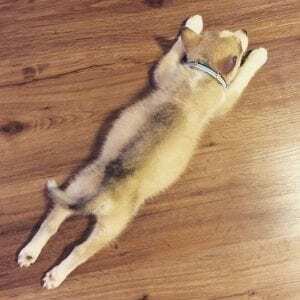 This dog sleeping position is, and an indicator of the dog’s comfortability with his surroundings and is prone to indoor companion dogs as homes are the most secure habitat to any dog. 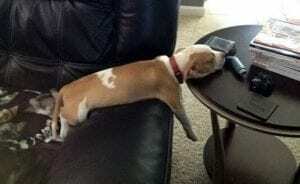 In this dog sleeping position, the dog suspends his feet in the air while lying on his back. It is a comical and funny position as the dog takes the shape of a dead roach. The possible reasons tour mutt may favor this sleeping is to expose their belly. This area is the least fury in a Dog’s body, and the sleeping position allows him to cool off. It is positions preferred by indoor pets due to their high energy levels and hence are prone to overheating if they sleep on their tummies. Another reason that a dog will prefer this sleeping position is due to the comfortability as all the dog muscles are completely relaxed. It is considered to be the most vulnerable sleeping position and thus will rarely note among outdoor working dogs. Some mutts sleep on their tummies, but the dog position is the most adorable of them all. In this position the dog stretches out its entire limbs and lies on its belly. They may look as if they are attempting to fly. It is a less comfortable position but makes it easy for a dog to get up and start moving as soon as they are awakened or sense something. A dog may favor this position when keeping its guard high on the owner or the owner’s property. The dog sleeping position provides enough rest, and behavioral patterns indicate that dogs who adopt this position are highly motivated with heightened energy levels. 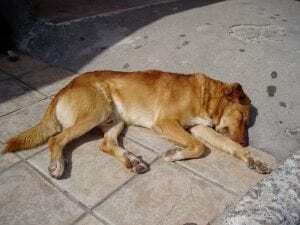 It is a common sleeping position among outdoor working dogs and wild dogs. This position is not comfortable by any means since the dog’s muscles are tensed to maintain the curled up effect. It has its share of benefits since it allows the dog to conserve body heat and protect its limbs and vital organs around the belly areas. 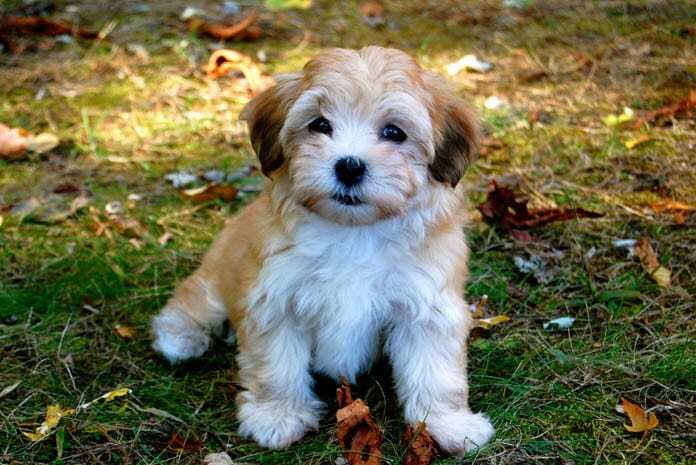 The dog’s alertness is also heightened and becomes extra sensitive to movements or sound. This position also enables them to stand up in case of any threat suspicion hence quickly, they are in a REM sleeping stage where their eyes are closed, but brains are active. This is where the dog sleeps in a back to back position next to its owner or next to another dog. It is a common sleeping position among wild dogs and symbolizes a special attachment to the owner or other dogs. It is also used to generate and conserve body heat in case of cold temperatures. This is an unusual sleeping position where the dog sleeps on the couch and rests his head on the armchair to maintain an upright position. This position helps in maintaining a proper spinal posture in case the mutt may have a back problem or experiencing neck pain. Sleep is a significant contributor to a dog’s healthy life and should be as comfortable as possible. 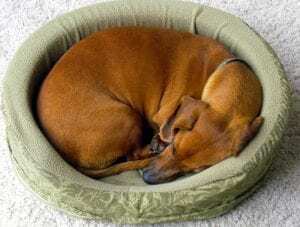 Each dog has its most favorite sleeping position just like humans do, and the six mentioned above are the most common. So whatever sleeping position you mutt prefers to make sure his accommodation is safe and comfortable.